Ben came up with the name ages ago and wanted me to make something to suit it. It took me some time to think of something deserving of the name but finally here it is. 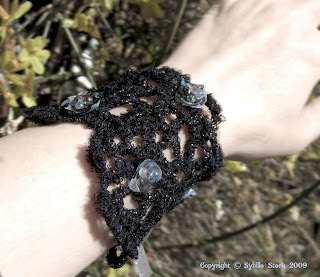 The bracelet has been made with a crocheted wire frame, which was then 'embroidered' tatting style with a mix of dark blue Habu silk covered steel and (also from Habu) a kind of lurex which in fact is more like thread-thin video tape. 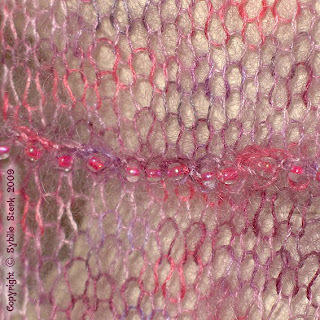 The effect is much nicer than lurex as you get a far more subtle shimmer and glimmer. 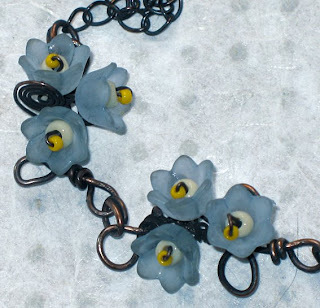 In the next step I added teeny 4-layer organza flowers in black and lilac and Magatama drops in matte grey, pale blue and glossy lustred grey. The final step was a gorgeous lilac organza ribbon threaded through the ends of the bracelet. 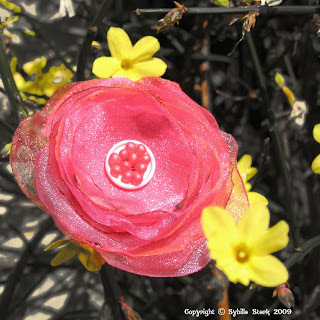 Above is one of the little silk organza flowers. The bracelet is fully adjustable and would suit a medium to large wrist. It's too wide for a small wrist. 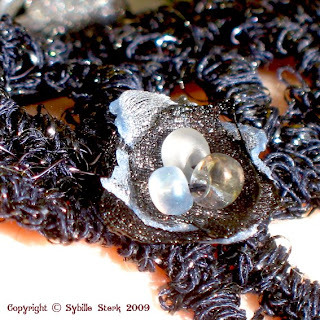 I think I will be making variations along this theme as I really like the look and feel of the bracelet. 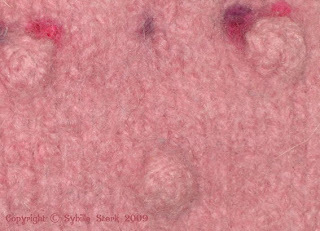 It is unusual and organic, soft but firm to wear and has interesting details. Something that will work as well with a little black dress as with a pair of jeans. The sun is shining and there is a hint of Spring in the air - FINALLY! 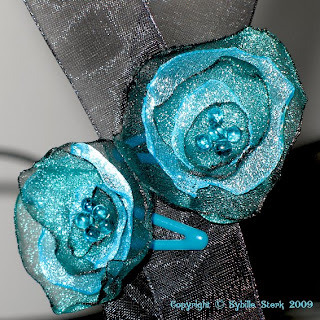 ... gorgeous organza flowers for your hair. 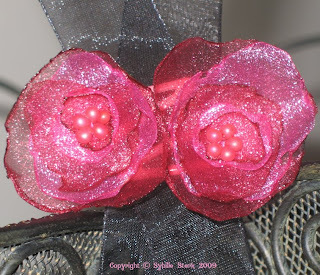 I've used 18 layers of petals on a small hair barrette that has been covered with shimmery white satin ribbon. 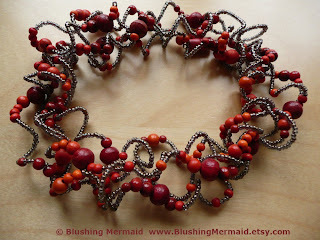 ... and some lovely frosted Miyuki drops in raspberry red. Totally gorgeous Spring madness. Soon this will be available for sale in my Etsy shop so you too can take part in the 'Flower in Your Hair' campaign to brighten up a dull day. The second flower I made for myself. 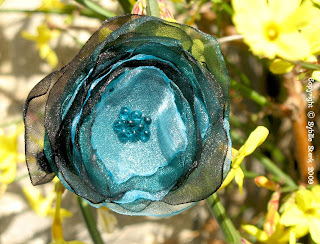 Eighteen layers of luscious, shimmery organza albeit in turquoise, bottle green and black on a black velvet ribbon, secured to a small hair barrette. The centre is covered in lovely shiny and glossy teal Miyuki beads. Yum! There will be lots more of these. I've just ordered more colours of the organza so I can continue the 'Flower in Your Hair' campaign with more delicious creations. Had fun yesterday making organza flowers to wear in your hair. The blue ones are the largest at about 6cm (2.5") with larger hair grips (professional hair grips from the a beauticians' wholesaler) whereas the other 3 pairs are only 4cm (1.5") in diameter. 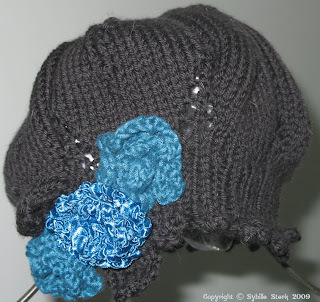 The small ones in pink and teal are perfect for small strands of hair, short hair and very fine hair, whereas the grips used for the blue and red/black flowers will hold larger strands of hair securely. 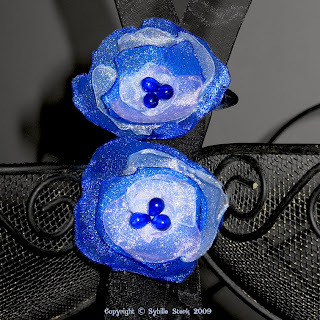 The blue flower has 7 layers of organza in cobalt blue, pale blue and lavender. 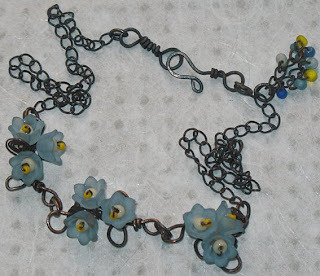 The beads are tear drop shaped and also cobalt. 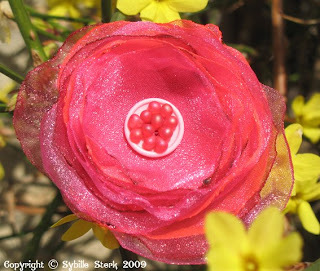 The pink flowers are made from 5 layers of red and pink organza. 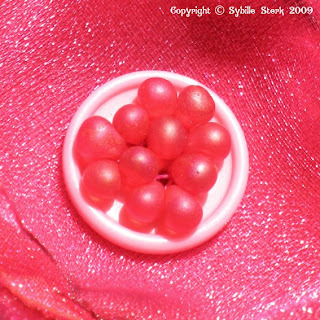 The beads are lovely lustred raspberry red Miyuki drop beads. 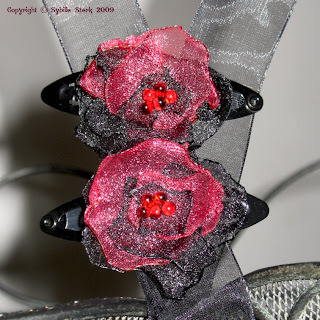 These Gothic flowers are made from 5 layers of red and black organza. The beads are lovely red and black lined Miyuki drop beads. 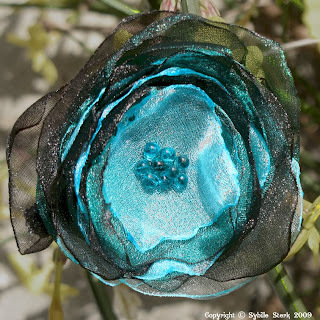 The teal flowers are actually made from deep forest green turquoise organza. 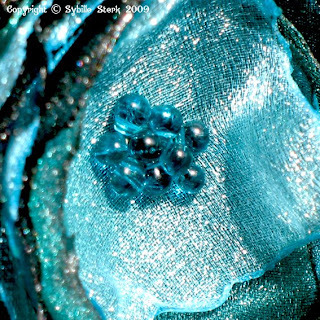 The Miyuki drop beads in the centre are also a soft teal. The teal and red/black flowers are mine. :-) The others are for sale. Crystal organza is an interesting material to work with - the organza is quite 'stiff', making it perfect for shaping. 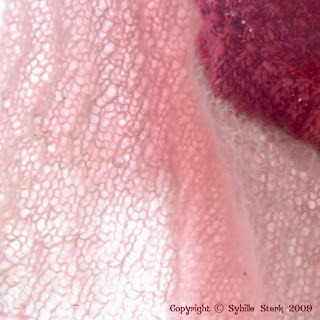 The light reflecting properties of the organza are almost like stained glass. Layering different colours creates a composite colour. Unfortunately this also makes it difficult to take pictures, especially on a grey day like today where the daylight alone is just not strong enough. The edges of the organza petals are all singed with the help of a candle (and a small jar of water next to it!) and ensure that the organza won't fray. It is a mix of mohair and silk from Habu, probably my favourite yarn company. They have a huge range of unusual and high quality yarns that are lovely to work with and that make wonderful garments. 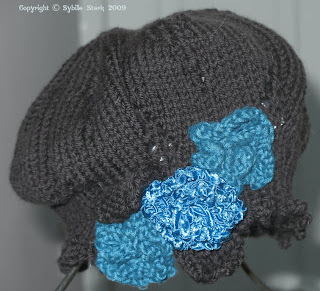 I've used Habu before in the blue Shosenshi shrug and the tiara and matching corsage I made last year and I am currently working on a lacy frost flower scarf with more Habu yarn. 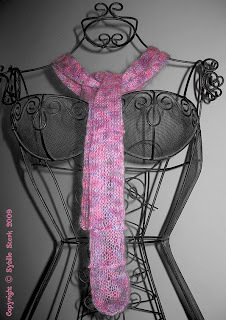 This is a really versatile scarf because it's fairly 'skinny' and so soft. This scarf is mine, but I will make more like this as they're perfect for Spring and Summer as they're so light and a brilliant way of adding a splash of colour. 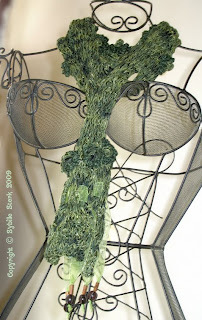 Janneke from Blue Heron Quilts kindly included my Forget-Me-Knot necklace in her Spring Greens Treasury. 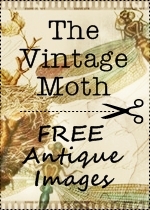 There are lots of lovely items in the treasury which is why I am especially happy that my necklace was included. 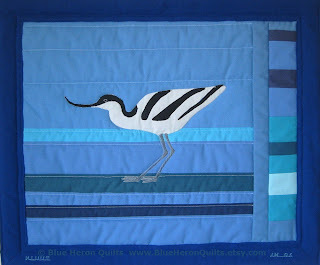 Make sure you check out all the items, including Janneke's beautiful and unusual quilts. Note: Pictures published with permission from Janneke. I've developed a new technique for this one and, hopefully, it will be the start of a whole range. I am so pleased for them as I'd never felted in the washing machine before, but I am very happy with how they both turned out. 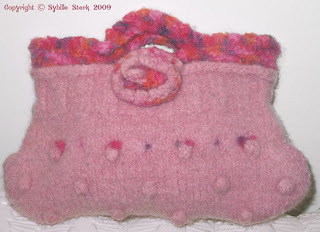 The bag has been knitted with 100% wool in a pale pink and trimmed with a variegated 100% wool yarn at the top. 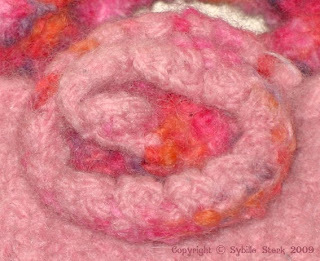 The rose is a mix of the two yarns. It closes with a little button on the inside and is unlined. It's a fairly small bag, but perfect for a night out. :-) If you need exact measurements, just drop me a line. It will go into my Etsy shop by the end of the week and will cost around £25. 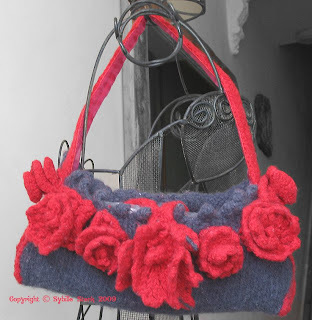 The bag was knitted from 100% wool in a French navy blue and a lovely bright right. Above you can see one of the roses in detail. On the top right is the closure that slips over the centre rose to securely hold the bag closed. On the bottom left you can see that the strap of the bag is lined with a organza ribbon. The bottom right picture shows the little pocket inside. The bag can be held by the strap or you can put the strap over your shoulder. It's not a huge bag, but you can fit quite a lot inside. 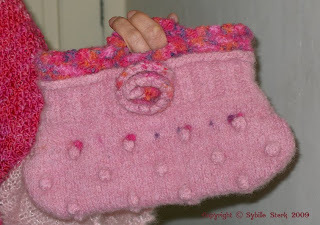 Like the other bag it will go into my Etsy shop by the end of the week. The cost will be around £40 + P&P. I know, I know, I just have a thing about wrist warmers. I don't like gloves very much because they make it so difficult to grasp/hold things, but in this particularly cold Winter something to keep your hands warm is needed. 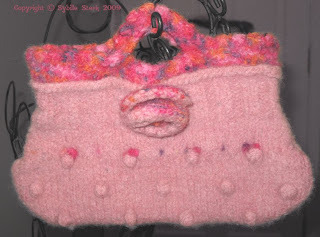 The pattern for these came from the latest (February issue) Simply Knitting magazine. 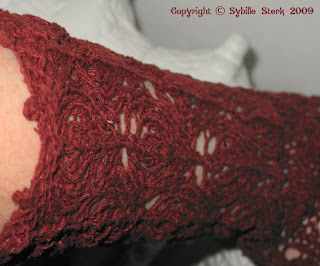 However, I used a different yarn from those recommended and had to make a few changes. 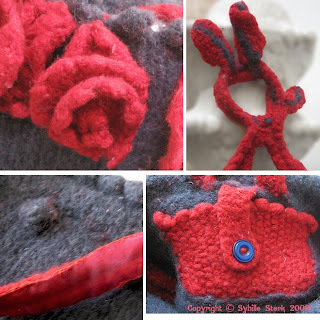 The picot edging is slightly different and they are longer than the original pattern. However, they'd look different even without my changes! 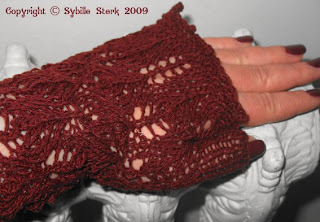 I've used a wonderful dark red rough silk that is pleasant to wear all year round and they'd be perfect to wear inside the house (typing, knitting etc) as well as outside. 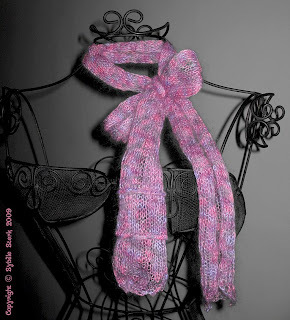 I am currently making myself a scarf to match and there will be more of these in different colours soon. This will also go into my Etsy shop by the end of the week and cost around £15 + P&P. This is my latest scarf. I love the Colinette ribbon yarn in various shades of green. 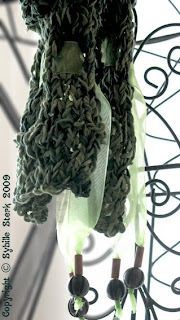 It's a long skinny scarf with pale green organza ribbons woven through it at the ends. 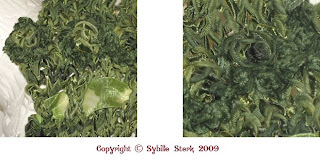 A view of the green organza ribbon woven through the scarf. 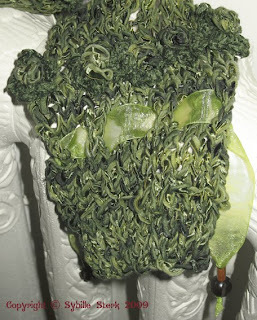 Above it is a row of little flowers knitted in velvety green chenille. And below is a detailed view of the ribbon and the flowers that cover the scarf randomly all over and in a row above the ribbon. 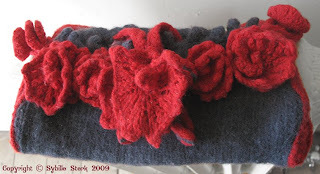 This particular scarf is not for sale, but I have more of the yarn in beautiful warm reds. Let me know if you're interested. 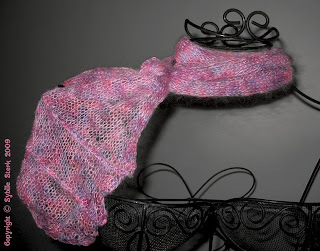 It's the perfect scarf for Spring/Summer or to brighten up dark Winter clothes. This shrug has been finished for a while, but I wanted to get some daylight pictures of it as well. 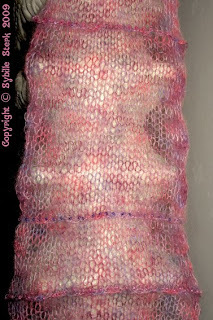 I have used pink variegated (hand spun, hand painted) merino/seacell for the main body of the shrug. 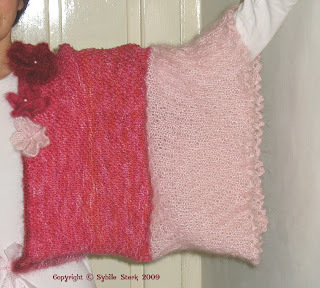 The sleeves are made from Rowan Kidsilk Night in pale pink. 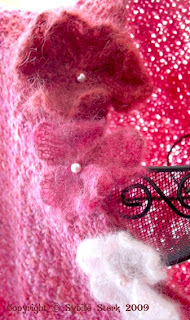 All the flowers (painstakingly knitted) have a glass pearl centre each and are all made from various shades/types of Rowan Kidsilk (Night, Spray and Aura). The flower at the bottom in the centre is actually a brooch that can either be worn on the shrug or anywhere else - for example, on a bag. 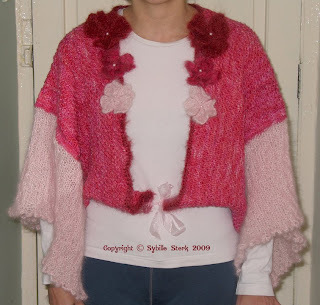 There is a pale pink organza ribbon to hold the shrug tight round your waist as well. My friend Caroline (the one who is running the marathon - see the link on the left) kindly modeled the shrug for me. 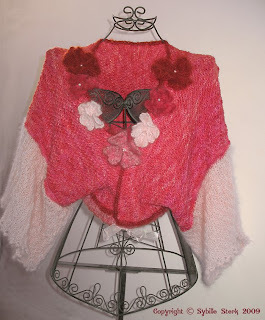 She's petite but the shrug will fit up to a medium/large due to the cut of the garment. 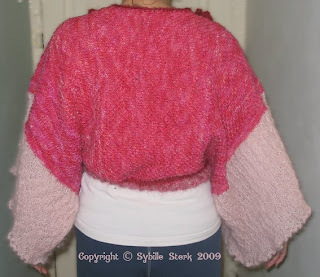 Here you can see the back of the shrug. And here you can see the width of the sleeves. 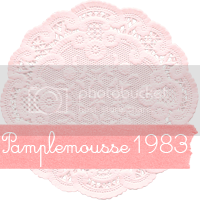 The sleeves - although warm and perfect for a wedding in Winter/Spring in a cold church or registery office - are soft as clouds. 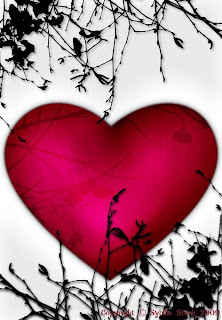 Finally, above the beautiful flowers in various shades of red/pink. The shrug will go in my Etsy shop by the end of the week. If you want to snap it up before, it's £70 + P&P.